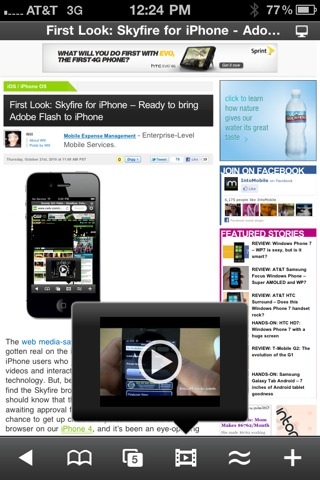 Yesterday, we noted that Skyfire would be bringing its Flash conversion browser to the App Store later this week. While the release was scheduled for tomorrow, Skyfire Web Browser [App Store, $2.99] has just gone live in the App Store. Skyfire Web Browser allows users to access Flash video content on iOS devices by sending the Flash content to the company's servers for conversion to HTML5. Not all Flash video is supported, however, with one notable exception being Hulu, which has not permitted Skyfire to convert its content. - Play millions of Flash videos - everyday, with no limits! - Be social: Share via Facebook and Twitter. - Stay in touch: Unique Facebook 'Quickview' allows you to see your wall and feeds with one click. - Standard browser elements: Tabs, search, sharing, bookmarks, history, etc. - Click the 'Explore' button for related videos, news trends, photos and tweets! Skyfire Web Browser is currently offered at an introductory price of $2.99, although it is unclear for how long the offer will be available and what the regular price of the application will be. The application requires iOS 3.0 and is compatible with the iPhone, iPod touch, and iPad, although no iPad-specific version is available. Update: Due to overwhelming demand, Skyfire has pulled Skyfire Web Browser from the App Store until it can beef up capacity to support the demand. The user experience was performing well for the first few hours, but as the surge continued, the peak load on our servers and bandwidth caused the video experience to degrade. Thus we are effectively 'sold out' and will temporarily not accept new purchases from the App Store. We are working really hard to increase capacity and will be accepting new purchases from the App Store as soon as we can support it.